Today, we’re continuing the series with a conversation with Megan Collins, author of THE WINTER SISTER, releasing from Atria on Feb. 5th, 2019. 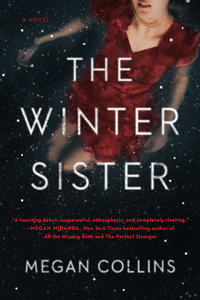 THE WINTER SISTER is an exploration of grief and guilt—how the two can compound each other and how forgiving ourselves can be even more difficult than forgiving others. Though the book begins with the murder of eighteen-year-old Persephone, its story really belongs to the people who loved her: the mother, Annie, who drowned her grief with alcohol until she had nothing left; the sister, Sylvie, who tried to escape her past by lying to her friends and herself along the way; and the boyfriend, Ben, who’s long been suspected of being the one who killed Persephone, even though he swears he’s innocent. Sixteen years after the devastating murder, the lives of these three characters intersect once again, and it’s only then that the truth about what happened to Persephone finally comes out. When I worked with my agent on this book, our goal was for me to get it down from 135,000 words to under 100,000 in order to tighten the story and improve the pacing. At first, that seemed like such an impossible task because it meant cutting a quarter of the novel, but once I got into a groove, I was trimming down sentences ruthlessly until I was left with prose that was much more muscular and could therefore pack a bigger punch than its previous, more padded version. I have a home office that I write in, and given my teaching schedule, I tend to do most of my writing in the mornings. This works best for me because my mind is fresh, and it means I can spend time at night just decompressing from the day by reading or watching TV.